Salty (even leftover!) 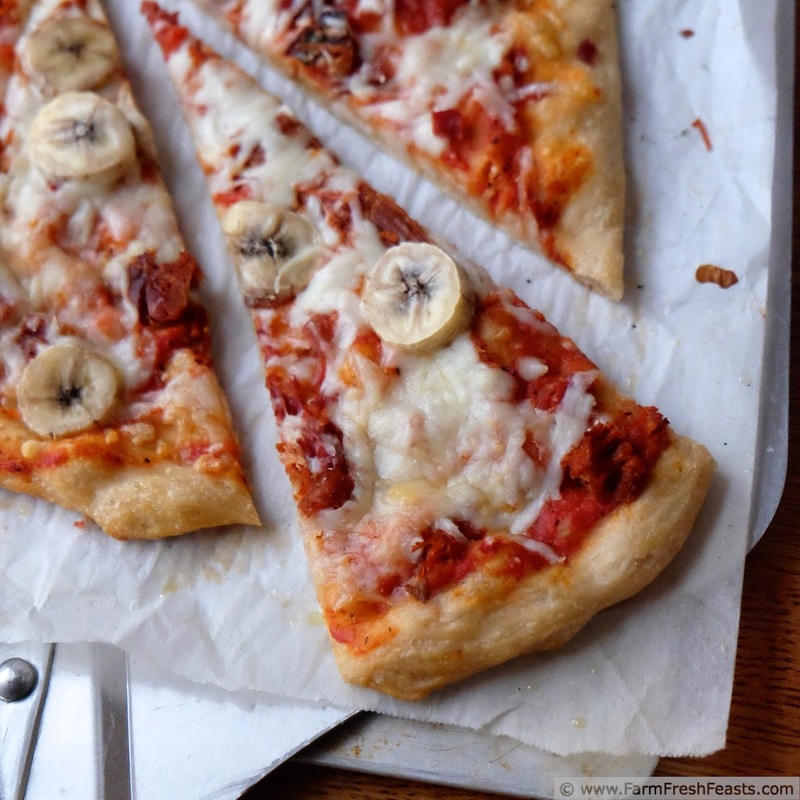 ham is a nice match for sweet banana slices in this unusual pizza. Updated photos, same great recipe. I am sure someone would think that this pizza falls into the category of Strange But Good. 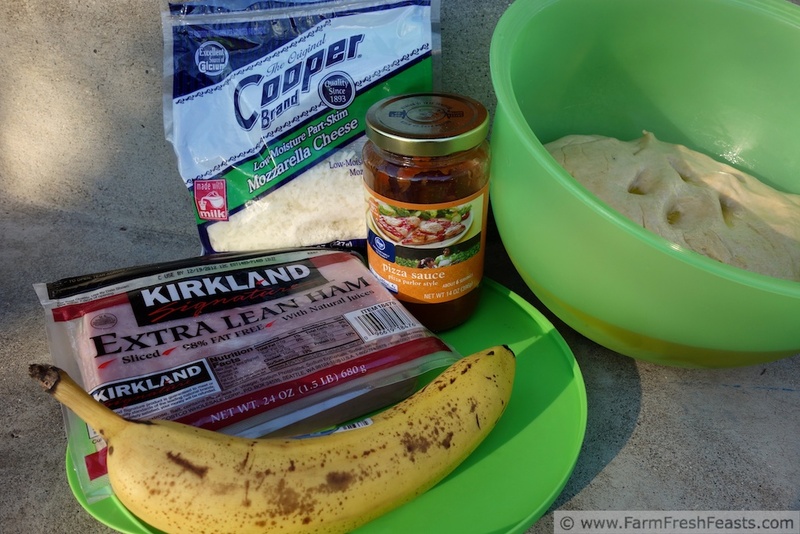 Ham and banana seems like an unusual pairing to everyone that hears it. Why is that? Do the pineapple people have such a good PR machine that no one considers bananas for pizza? You'd think as tropical fruits they'd all stick together. I first had this combination on a pizza in Germany. And I loved it. I tried it initially because, hey, we were all trying the weird things on the menu. Come to think of it, I first had corn on a pizza while in Germany. That combination stuck with me, though, and whenever I have the happy coincidence of ham slices, just-about-to-be-over-ripe bananas, and red sauce I make a pizza. The family tolerates it, but I love it just like I did the first time I tried it. It's fast to throw together and tastes delicious. 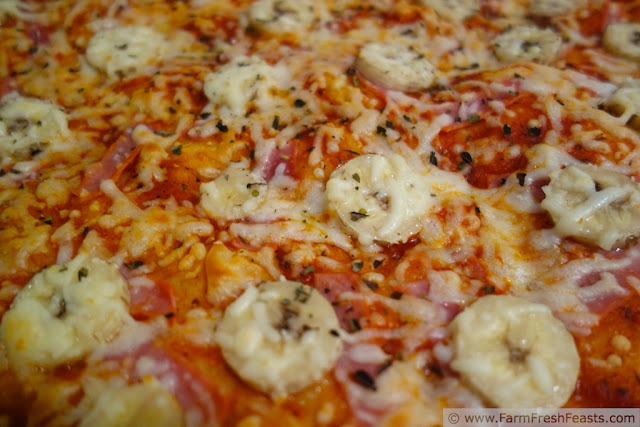 Note: if there's any of this pizza left over, pick off the bananas before refrigerating. You do not want to see them on your pizza the next day. Trust me. Preheat oven to 450 degrees Fahrenheit. My baking stone lives in my oven and I bake pizzas on that. Use a cookie sheet if you'd like. On an oiled piece of parchment, stretch the crust out into a pleasing shape. Top with red sauce, ham, and cheese. 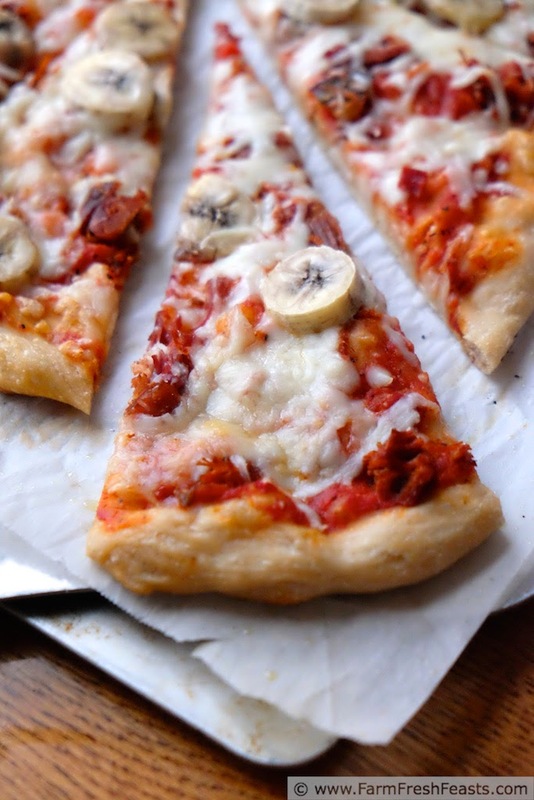 Scatter Place slices of banana evenly around the pizza pie. Sprinkle with seasoning. Bake 5-8 minutes, then shake the parchment out from under the crust and continue baking 3-5 more minutes until cheese is bubbly. Cool on a wire rack then slice and serve. NOTE: I am so sorry that this pizza post appeared on a day not a Pizza Friday. I accidentally posted it over the weekend, caught it, deleted it, and thought I'd re-done it to post on Friday but apparently this pizza really really wanted to greet the world earlier. So here it is. This pizza is linked up with Laura at Sprint2TheTable's Strange But Good party. I can definitely see how these flavors would work:) Ham/pineapple was always a favorite of mine! I think it's the sweet/salty combo that I love so much. What a great combo! I don't always have pineapple on hand, but I always have bananas in the fruit bowl. I'd love to try this. I never thought about how ubiquitous banana is in my house, but it makes me wonder if the pizzeria in Germany ran out of pineapple and tried banana and it stuck. This is definitely strange, but I'd be willing to give it a whirl...well minus the meat, but only because I'm weird. Who knows, maybe one day meat will be back in my mix. By the way, I'm now craving pineapple at the mere mention of it in the beginning of your post. Hope you had a very Merry Christmas. I could eat pineapple too. Never got enough of it in Hawaii. And a Dole Whip sounds delicious on my poor sore throat . . .
Curry and chicken does indeed add to this pizza! This combination is somewhat common where I live (Sweden) and some also swear by cashews on it, but I prefer without. Don't feel too limited in your choice of cheese, either - there is more than one variant which works wonderfully with (I want to keep alliterating, but can't) curry/banana/ham/chicken. In the same vein, don't be afraid of using stronger-tasting meat instead of (or combined with) the ham, the curry can handle it. Curry and Chicken and Cashews--oh my! Sounds like a winning combination.